Not Familiar With Social Media? Don't Have The Time? You've Come To The Right Place! We can setup social media accounts for you to maintain, or we can completely manage them for you. Technology is constantly changing, and with it come many new ways to market your business online. As a busy business owner we know that it can be extremely difficult to keep on top of learning new services and even more difficult to maintain them on a consistent basis. At WebLeaps we offer social networking packages to so we can manage your online presence which allows you to concentrate your time on what really matters - running your business. 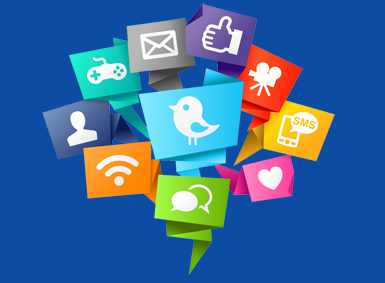 We can setup your online social presence for you and maintain it or give you the control to maintain it yourself. Social networks include, but are not limited to: Facebook, Twitter, Pinterest and Instagram. Setup of social media accounts include adding basic information including contact information, profile/header photos, adding contacts, pictures and more depending on the specific service. Do you lack time to maintain your social media accounts? Do you have no clue about social media, and don't care to, but want that presence for your business? We offer maintenance packages so you can be as involved, or uninvolved, as you would like. If you would like to us to maintain your social media we can notify you when customers contact you, and respond to them with your reply so you can communicate with clients without ever needing to actually login. Maintenance includes posting news and updates, following users, adding new photos and more. We will sit down and discuss all options available to tailor a maintenance package to you that will best suit your, and your customers, needs.